Posted: April 27th, 2009 under Morse. 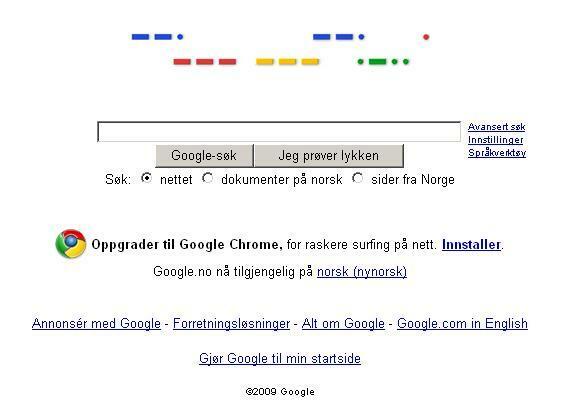 When I checked Google this morning, I noticed they swapped their logo for morsecode. It read google, when clicking on the morsecode, I found that they link to Samuel F.B. Morse. He was born April 27, 1791. Check my picture here to see it, or go to Google yourself. What a nice gesture! He “hated” American Catholics and “would have denied citizenship to the foreign born (especially the Irish) and he wrote pamphlets abusing those who would abolish slavery”. That’s right. He loved slavery and enslaving black people. He said it was “not a sin” in Christianity, and that slave owners were doing so for the “wisest purposes, benevolent and disciplinary”. Sounds a bit like a 19th century version of the White Supremacists, only wearing smarter clothes and without the skinheads. He donated loads of money to these idiots. So much for Google’s “Don’t be evil”. He didn’t invent the telegraph anyway. And the “Morse” code used these days is not the same code that Morse invented. It is only called “Morse” code because it is based on it. Hi Duncan. That paints a totally different picture of him.